Every August, I spend a week in the Adirondacks at Baekeland Camp. It is an idyllic place. The picture at the right is the dock outside our cabin. It is a typical Adirondack Camp, with a large house and a number of small cabins scattered around the property. It can only be reached by boat and there’s no phone, no TV and no cell phone service. Our cabin is right on the lake, as you can see. I believe that it is one of the most beautiful places I’ve ever been to and feel fortunate I can go there every year. The camp was bought from the proceeds obtained through the invention of plastic. 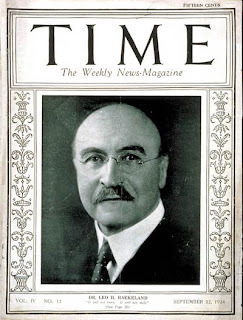 The patriarch of the family that purchased the camp early in the 20th century was Leo Baekeland, the inventor of plastic. Last Friday, July 13, 2007 was the 100th anniversary of the patent application that Leo filed for his invention. There was a fascinating piece on NPR about Leo and the impact plastic has had on the world. The camp is still owned by the descendants of Leo Baekeland and the family lore stretches back decades and decades. Our family lore goes back only one decade, but it is rich nonetheless. This camp has become integral to our family history. We are already thinking fondly of summers past as we look forward to our next visit in August. So, happy anniversary, Leo….and thank you, wherever you are. What a wonderful photo! As a long-time resident of the Adirondacks I can understand why you come back each year. Fascinating story about the plastic man…I had no idea. Thanks for sharing. « Let’s Go to the Videotape!